Sophisticated, rustic elegance against a breathtaking backdrop doesn’t get sweeter than at a vineyard wedding. If you’d prefer to celebrate inside, planning a wedding at a winery can offer the same pastoral style with the reliable cover of an indoor reception. Of course, the best wedding favor would be an actual bottle of wine from the hosting vineyard. There are pros and cons to both options, so you may want to base your choice on the type of atmosphere each setting will offer. If you choose an outdoor wedding, you’re bound to have a backdrop of lush green leaves and trees. During the autumn, leaves that are changing color will be even more stunning in the background. The vineyard will also have a gorgeous vista of a sprawling valley, stunning mountains or dense woods. If you’re getting married during the hot summer or you just want to avoid a last-minute change due to bad weather, check with wineries to find out which ones have an indoor banquet room or event center. When planning a small, intimate wedding, you may even be able to have it in the wine cellar or barrel room. Opt for a Tuscan theme, which will include Italian components. Perfect colors include gold, olive green and brick red. Decorate with hanging lanterns, ivy, parasols, old world maps, sunflowers and dripping candles. If the venue has a few fountains, even better. 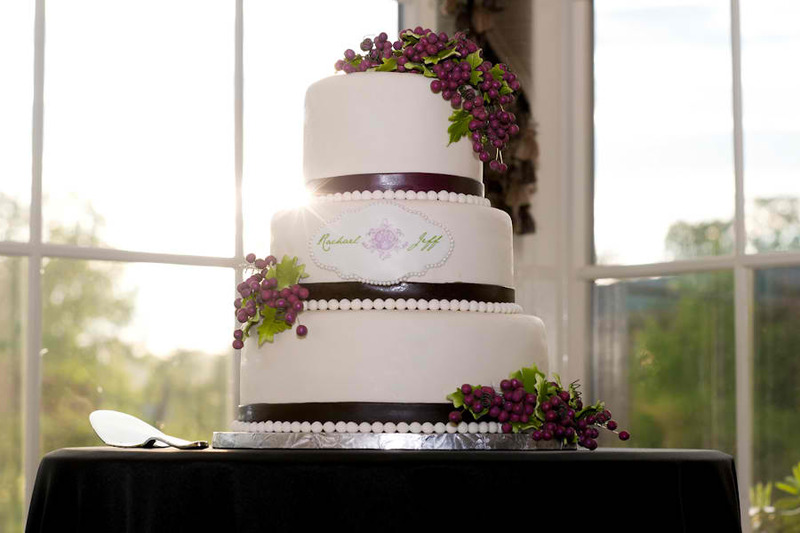 For an overall true vineyard theme, work with a color palette of creamy yellow, rich green, deep purples and dark reds. Decorate with grapevines and small white lights that shimmer through sheer white fabric. Place grapes (real or fake) down each table, along with faux ivy. A cellar theme is the most rustic of all. Choose a color scheme of browns and burgundy and decorate with hanging candle lanterns and rustic barrels. This is especially appropriate if you’re going to have your reception in an actual wine cellar. Help guests find where they belong with place card holders made from wine corks and table numbers printed on wine bottles with custom labels. 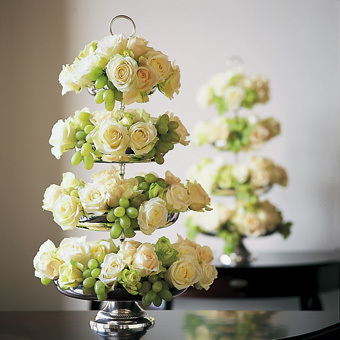 Order floral centerpieces that include grapes and use empty wine bottles with candles for extra lighting. Reflect your setting in the bouquets by choosing flowers in wine-like shades of purple, red and cream. Wineries have to operate during the day and most of the time they’ll only accommodate a wedding that starts after 5 p.m. This can include setup, too, which means your vendors will have to prep quickly as you get married at an off-site ceremony. For many couples, this time crunch just isn’t convenient, which makes it worthwhile to find a vineyard that’s a bit more obliging. Find out if the vineyard has a certain timeframe for the arrival of guests. If guests aren’t allowed on the property before a certain time, but a few show up anyway, you could end up being charged extra when all is said and done. Some vineyards and wineries require the couple hire an On-Site Manager (provided by the venue). The manager won’t help with setup, but they will be on hand in case of an emergency. Mainly, their job is to make sure that the venue is being taken care of during the wedding. While this will be an extra cost, sometimes it’s simply non-negotiable. Certain wineries won’t allow – or be able to fit – all guest vehicles on their property. This means you’ll have to arrange transportation, like shuttles, to and from the venue at both the beginning and end of the event. Find out what kind of alcohol you can serve during the reception. Will only wine or wine and beer be provided? Can you bring additional alcohol to create a full bar? Will a winery staff member be on hand to answer guests’ questions about certain types of wines and to pour? Don’t just choose any ol’ wine on the vineyard’s list. Work with a manager to find out which wines pair best with your menu. Also, find out which reds and whites are the most universally appealing so that a majority of your guests are satisfied.